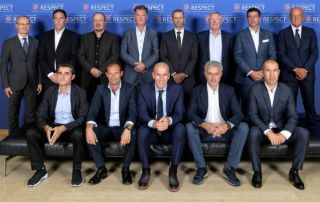 Among the coaches present at the Uefa meeting are Manchester United’s Jose Mourinho and Arsenal’s Unai Emery, along with other big names. And according to BBC Sport, coaches have united to call on Uefa to scrap the away goal rule as it’s been agreed that it no longer feels relevant in the modern game. This seems a logical move and an end to a rule that perhaps made more sense in a time where clashes between the big clubs were closer and more cagey affairs. But with more of an emphasis on attacking play now, there is little need to provide an incentive for clubs to show ambition in away ties, as it is, more often than not, necessary anyway. And with teams perhaps not as defensively sound as they used to be, such a huge change to the complexion of a tie shouldn’t rest on something that isn’t as challenging to do as it used to be. That said, with the rule initially brought in to avoid extra time and penalties, perhaps it’s a better method than one that can lead to more fatigue for players in games that do finish level, as well as perhaps settling ties on the rather more luck-based format of a series of spot-kicks. Should the away goal rule be scrapped?